"A person would be well advised to study these notes of such a master." Some readers' comments are below. 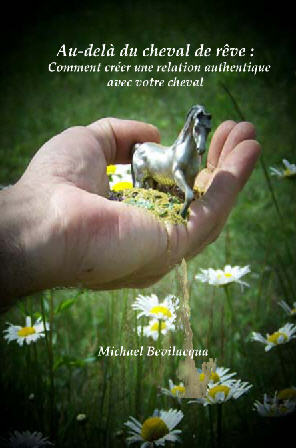 Ce livre décrit comment permettre à une relation honnête entre l’humain et le cheval de s’épanouir en se libérant des nombreuses croyances traditionnelles concernant les chevaux. La relation ne se base pas sur l’éthologie, mais plutôt sur les possibilités étonnantes qui surgissent au sein de la dynamique entre les chevaux domestiqués et les humains. Il s’agit ici d'atteindre la relation insaisissable dont on rêve souvent, mais que peu trouvent réellement. This book is far too good to miss out on. An inspirational read, that any horse lover should have. 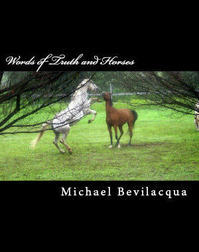 Michael Bevilacqua writes with passion and his love for horses, in a way that is clear and easy to understand. It is a beautiful example of what every horse owner can achieve: A complete understanding relationship between human and horse. An amazing book that I will continue to read again and again! I found this book very helpful, imparting a rounder, fuller view of this journey we are on with our horses. It has been amazing to me that Michael's experiences learning and teaching his horses is so supportive....the emotional and visual help I am getting from this book is huge! As a new horse owner, I found myself wandering in the maze of all the training methods and approaches available today. None of them spoke to me ... none of them spoke to my heart. Until now. Yet, the author does not describe an approach or a method. Instead, he shares an entirely different way of being with horses. 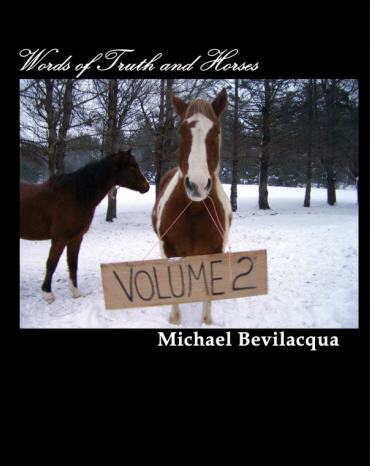 Michael Bevilaqua truly loves horses and candidly shares his many experiences of feeling and thinking differently about standard horse training. He heard what the horses were saying to him and found that it is possible to have a relationship based on mutual trust and love - to share a unique language. This book tells the story of how he left behind the old ways and set out on a new path, without force, bridles, pressure of any kind, dominance, or restraint. Having ultimately found his way to Nevzorov Haute Ecole (NHE) and becoming the School's Worldwide Representative, he clears up common misunderstandings about NHE, its research, and its unique way of being with horses. Michael's writing is clear, open, honest, and heartfelt. Novice or old hand, if you have horses in your life, you owe it to them to read this book. I have read a lot of books on horsemanship, but I must say that this is unique. What I want to share about it is the strong evocative power included in this book. A lot of 4D images! When I am with my horses, I think of several passages of that book. I recollect the images and perceive the variety of experience one person can make with horses, a full range! It is certainly a window on Michael's heart and love for horses. That window is wide open and by looking through it, I smile out of deep joy. I smile because with simple words, genuine images this book brings me back to The Journey, my Journey.Every single Journey of each of us is different from each other, athough we can see true similitudes. 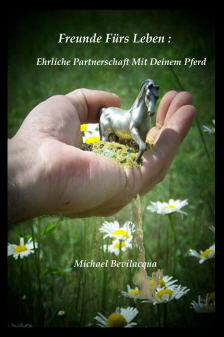 As usual I am the one who looks at what connects people instead of what separates them and I would like to encourage people to get into the book and take part of Michel's Journey with horses. Maybe that open window will attract their hearts too. 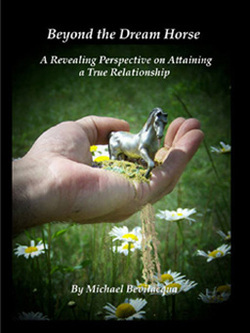 I want to give my personal thanks to Michael for his awsome book Beyond the Dream horse. It is the most beautiful inspirational book about horses I have ever read. I loved the openness of Michael's words. His humbling journey is a joy to read. The realization of his horses' communication with him and questioning mind of others' blinded eyes made my heart swell. The book was sooo good. I am looking forward to rereading it and purchasing it as gifts...many people need to read this!! It stopped me in my tracks, made me realize how far off my original track I had gone, and helped rebalance myself both with my horses and in my daily life. Michael Bevilavqua isn’t talking about the subservient relationship here – where the dream horse does everything perfectly exactly when you ask, with little or no expression. He’s talking about a relationship of equality where the horse is allowed to express its feelings and the person listens, just as they would to a true friend. I highly recommend this book as a source of inspiration to start or keep you on a new path of achieving that true relationship with your horses. Michael Bevilacqua is a contributing author to Operation E-Book Drop which provides free e-books to coalition and peacekeeping troops around the globe. Join the Facebook page or click the image for info about this important project.